Laser prentin is an electrostatic deegital prentin process that rapidly produces heich quality text an graphics bi passin a laser beam ower a charged drum tae define a differentially charged image. The drum then selectively collects charged toner an transfers the image tae paper, which is then heatit tae permanently fix the image. 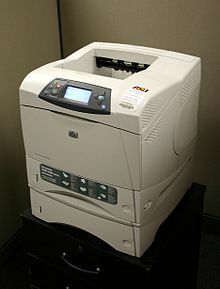 As wi deegital photocopiers an multifunction prenters (MFPs), laser prenters employ a xerographic prentin process, but differ frae analog photocopiers in that the image is produced bi the direct scannin o the medium athort the prenter's photoreceptor. Hence, it proves tae be a much faster process compared tae the latter. This page wis last eeditit on 2 Apryle 2017, at 00:15.